NEW YORK (CNS) — As the lively profile of a wildly successful uber-geek, “Steve Jobs” (Universal) is likely to appeal to many a youthful tech fan. Parents should be aware, however, that this is a morally complex life story — the computer pioneer and Apple, Inc. co-founder died in 2011 at 56 — recounted with a vocabulary that’s anything but user-friendly for younger moviegoers. Screenwriter Aaron Sorkin, creator of TV’s “The West Wing,” brings his patented cut-and-thrust patter to Jobs’ biography. He structures his story around three landmark product launches: 1984’s unveiling of the original Macintosh, the presentation of the NeXT computer in 1988 and the 1998 introduction of the iMac. What these public events, and the behind-the-scenes moments surrounding them, reveal — via Michael Fassbender’s nimbly mood-shifting performance — is a volatile and enigmatic genius whose blustering arrogance masked a deep-seated vulnerability. 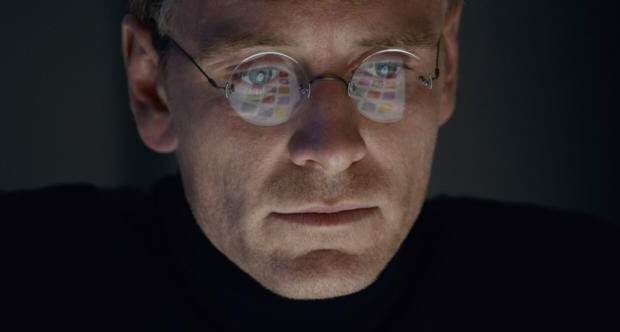 Adopted as an infant under circumstances that troubled him in adulthood, Jobs has a tense relationship with his born-out-of-wedlock daughter, Lisa (Makenzie Moss). In fact, so great is his antipathy toward Lisa’s mother, his despised ex-girlfriend Chrisann Brennan (Katherine Waterston), that Jobs publicly denies his paternity while implying that any one of host of men could be Lisa’s actual father. Although he eventually relents, Lisa — played, at older ages, first by Ripley Sobo then by Perla Haney-Jardine — is left emotionally scarred by her absent father’s attitude. Jobs’ closest professional relationships are equally fraught. His long-suffering gal Friday, Joanna Hoffman (Kate Winslet), has her loyalty, and patience, tested at every turn. Jobs’ longtime collaborator, Steve Wozniak (Seth Rogen) — a friend since before their legendary days tinkering together in a California garage on what would become the first Apple computer — finds his old partner admirable yet maddening. As for the man Jobs recruited early on to be Apple’s CEO, Wall Street veteran John Sculley (Jeff Daniels), his role varies, over time, from patron and father figure to outright adversary. In short, director Danny Boyle’s engaging character study provides viewers with a balanced portrait of a man who was, at once, a radically deficient parent, an unpredictable business ally and a profoundly gifted designer and retailer. Taken as such, Jobs iconically embodies the extremes of his baby-boomer generation: creative but supremely self-absorbed, relentlessly driven at the office but messy and unsettled in his private life. Though his underlying qualities eventually win at least partial audience sympathy, experienced discernment is required to work through the morass of contradictions produced by Jobs’ mercurial personality. Particularly with regard to ethical matters, his is a record of behavior better pondered by the well-grounded than absorbed by the impressionable. The film contains mature themes, including illegitimacy, a bit of irreverent and sexual humor, about a half-dozen uses of profanity and considerable rough and crude language. The Catholic News Service classification is A-III — adults. The Motion Picture Association of America rating is R — restricted. Under 17 requires accompanying parent or adult guardian.